Given the state of affairs from which they emerged, it is hard to comprehend how Shillong boys ‘Pip of the Fourth Mother’ made their way out. Period. They are the sort of band that you know could never even join in a Birthday sing-song without adding crashing bass-lines, breezy vocal accompaniments, the sort of un-synthesized rhythm arrangements once favored by L.A-rockers ‘The Offspring’ and a buttress of Dirty Punk/pop lyrics. Theirs is a sound that is willfully meek (damn you critics!) and technically overbaked, one which I haven’t had too many encounters with, in the recent times. What sets this five piece ensemble apart from the stockpile of hedonistic nonsense Omni-present in today’s Indian-rock Circuit is the wisdom of jollity flowing through each of the bands’ originals; egos seem to have been checked at the gate, allowing the quartet to freely discover a whole new level of different sounds and modes- both on and off-stage. In essence, POT FM sounds like a 51st-century abduction of alien-funk rock, packed with bubblegum popping dynamics and KFC-crunchy breakdowns. Having a good time is a major bee in their bonnet and it features greatly in their lyrics, sound and their stage act. To them, nothing compares to the sound of a large crowd roaring to their music. They also understand that not everybody can or would appreciate, or for that matter even understand their brand of Punk-inclined tunes. However, they do not plan to compromise on what they stand for musically for they think, it is their right to do whatever they want to. Such noble intent accompanied with such talent is a combination, hard to find and that is exactly why we advise you. Dear reader, to go google these guys up or add them on MySpace. Q: What inspired you to make music together? 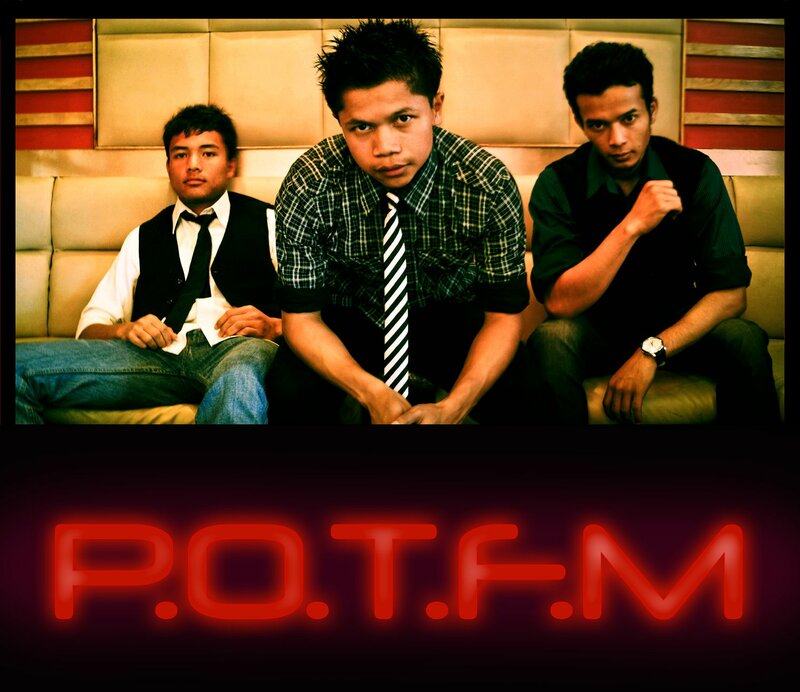 And how did the name POT-FM come along? Well ever since we met and talked music, we were very comfortable with each other’s views. Jason and Ben had a lot of common thoughts about live music and what it means to them. Apart from that, they just leave everything else to their mp3 players. The current bassist, Dauni, has always been a good friend of Jason’s back in Chennai through College and ever since he joined the band in December 2009, he has contributed a lot in terms of creativity in music and live performances. We feel that all the three of us agree a lot when it comes to live music and were a family now. No wonder we all started off our music venture as drummers for different bands..lol. What inspires us to make music is, well, nothing really. We just love music and we are just comfortable playing whatever we feel like and not giving a hoot about whatever anyone says. We conceive this certain equilibrium in life wherein we are able to vent our aggression through our music and be very sober people outside our musical activities. And we intend on doing this indefinitely. Q: What has been the progress of your music ever since you started out? Ever since we started out as a band, people have really appreciated our music to a great extent. We started off my releasing a promo single called “Shillong” which landed on “Vs the world Vol4”, “ The Great Eastern Rock Vol 1” and on countless cell phone handsets, mp3 players etc. We all grew up in this small town called Shillong and we just thought it deserves a song. We tried to bring out the essence of the place through the song and were very happy about it J . Apart from that we do have 13-14 Original compositions which we play at our live shows. Different people have different opinions on which songs they like more from our sets which we think is good. Were packing more aggression and energy in our new songs which we think defines us more. Q: Could you elaborately describe your music-making process? How do you guys craft your compositions and your songwriting procedures? What inspires you to piece things together? The way we make our songs is very haphazard and rational in a way that we don’t tend to make our songs sound too cliché. We achieve that by collecting a lot of riffs and melodies during jam sessions and recording them. Then Jason has this scrapbook where he writes a lot of meaningless sentences. These riffs ,melodies and lyrics are used as fillers for songs that we come up when we are inspired and we keep in mind that whatever we create should be relevant to a subject which inspires us to piece these things together and as catchy as possible like sucking rock candy off a stick. Q: Tell us about your latest single ‘Lun’ and about the E.p that’s in the making. Who all are you working with on it? “lun” is a semi slang in Khasi. It means noob/idiot. Lyrically, the whole song sums up the “lun” activities about a guy dying in the arms of time and who would give it all for a second chance at life, anything to start again. We are producing one song at a time for the EP and it will take a little more time because we really can’t decide which five songs to put in it from the 12 OCs weve done so far. Were even thinking of going full length. But again, the new songs are of a different sound altogether and some of which are in talks to be sold as singles to different clients lol..hmm. We may just dump everything leftover into one LP.well look into it later. Were working with orange Byte Studios, Mumbai for the 5 track EP. We do the recording at home and we send it over to them for the mixing stages and afterwards. The Rock scene is definitely headed “somewhere” , although its moving in a very slow pace. Im talking Northeast Centric. Bands ruing about the scene is obviously human but if they can be superhuman enough for once to realize that they should not expect changes to come up in the scene and that they are the ones to make it change then things would be a lot better. As of now, the event organizers are bigger than the bands. Hands down. Terrible sound at gigs is not an option here in the northeast, sorry for being blunt but we need good live sound producers here in the NE. Q: What is the image that you’re looking for as a band? Were looking for an image that makes us look and sound refreshing, fun and we wanna’ have such a velocity that it makes people sweat! Its all about having fun for us leaving skill and musicianship aside. The reason being there are millions of good bands that can play note perfect gigs in the world but not many are capable of give their audience/listeners a good time. Its not really about people looking at us as “musicians”. We would rather have them look at us as “artists”. Q: How important are lyrics in your scheme of things/ approach to songwriting? What do you guys mostly write about? Oh the lyrics are really important. We mostly write about day to day experiences and if ever we come across an event that we think deserves a song, we write something about it and these are the serious songs. We also like to write about insignificant events because nobody cares about them and we get this air of freedom and bliss that kind of reminds us of being young and joyful. The latest “insignificant” song in our scrap book is called “sleep until you sleep”. J Its about nagging a friend lying down not trying to fall asleep. Haha. Q: Does reality TV really change lives? Do you think it proves to be a good platform for non-mainstream music? Has it in any way helped the band to grow musically or otherwise? Tell us about the entire Center Fresh|DY-365 Rock Hunt experience. Reality TV shows are very manipulative. Again, as we’ve mentioned before, “Event organizers are bigger than the bands”. Whether it helps bands with their music or not is what we don’t know. It depends on the extent the size of audience and the type of audience it has. The DY365 Band Hunt was a good experience but it turned out to be a big scam in our opinion. Long story cut short, It was just a “TV Show”. Q: Do you think that sustaining yourself on just the band/ music in general is a goal that is slowly creeping towards being accomplished? Probably. But there is a lot more to do but if you’re referring to the long run in general then yes it is plausible. Q: How significant do you think the internet is in today’s situation? How has it influenced your approach towards getting your music out, so far? The internet is a vital tool in the market. There are some event companies that even run 80% of their business online. Band should be savvy enough to tap this and use it efficiently. Heck! You even have internet guides to proper band management. So if your band isn’t online, you have nothing to lose! Get Online! If you don’t know how or don’t want to use the internet, get a publicist to do it for you! Q: Give us a brief account of your experience in the Bryan Adams Rockathon. The Bryan Adams Rockathon was by far the best show we’ve ever had. Everything about the event production was so professional. From the tech rider agreements to the sound check sessions and the whole event upto completion. Credit goes to Nitin Chandrachud from Pune. We did a 45 minute set and we had the most awesome gigging experience. We gave the crowd our energy and they gave it back to us. The organizers had to hold us back on stage to make some announcements in favour of the band and we were out of words, out of breadth and full of gratitude for everyone. We dint even have time to breathe when we got off stage, oh man. That one experience has raised the bar for us and we shall ever try to comply. We did not win it but yes we won a lot of hearts and for us it was victory and musical bliss. Q: Whom do you consider to be the band’s biggest asset? Q: Most Punk rock outfits are three-piece bands- any idea why? Does that in general offer any particular advantages over more conventional set-ups? Robin Scherbatsky from ‘How I met your mother’ or Rachel Green from ‘Friends’? Robin !Robin! Robin! Silvio Berlusconi is a _______ Huh? Pron Chi? Sahil Makhija in a toothpaste commercial or Sahil Makhija in the next Karan Johar Blockbuster? Definitely on a Toothpaste Commercial..haha.. he dosent let anything slip by him. Q: What keeps the band rooted to Punk rock? We grew up listening to NoFX, The Offspring, Blink 182, Pennywise, Social Distortion.. so it just goes without saying. Q:What does 2011 have in store for you?